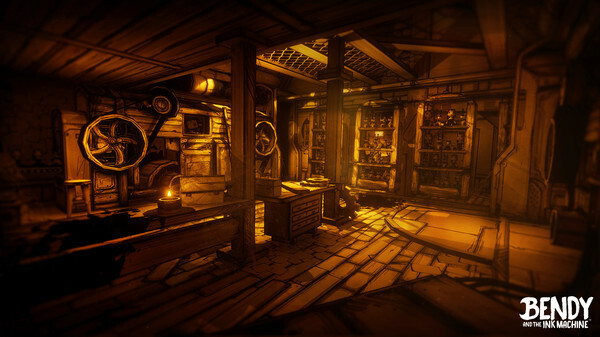 Rooster Teeth Games is preparing to launch the complete version of Bendy and the Ink Machine, a surreal horror game based on 1930s cartoons that originally released episodically on Steam. This complete version is doubling as the game’s console debut, and Rooster Teeth Games has a new trailer showing off the weird and eerie vibe that has made Bendy and the Ink Machine an early hit. As you can see in the trailer, Bendy and the Ink Machine uses its old cartoon inspiration to unsettle its audience via juxtaposition, taking imagery that is generally considered harmless and corrupting it with decay, violence, and dread. It’s a classic, off-kilter horror technique, but the artists at Rooster Teeth have gone to great lengths to make this one stand out. While Bendy and the Ink Machine was a four-part episodic experience when it released on Steam in 2017, this new version not only collects all the episodes in one release, but it also introduces a fifth (and final) episode, called The Final Reel. A physical version of the game is available for preorder now at GameStop, which is the exclusive retailer for that version. Bendy and the Ink Machine will launch for the PlayStation 4 and Xbox one on October 26, 2018, and later for the Nintendo Switch on November 20.